This image taken Nov. 8, 2018, at 1:12 a.m. EST comes from the Parker Solar Probe's WISPR (Wide-Field Imager for Solar Probe) instrument. It shows a coronal streamer, a bright structure that develops over active regions of the sun. The bright point near the image's center is Mercury. The Parker Solar Probe is doing well after its first flyby of the sun, and it will soon begin returning groundbreaking data about how our star behaves. Yesterday (Dec. 12), four researchers gathered at this year's fall meeting of the American Geophysical Union (AGU) in Washington, D.C., to share the early success of NASA's Parker Solar Probe. The director of NASA's Heliophysics Division, Nicky Fox, started off the news briefing, which was streamed live online, by describing the decades of work that led up to this mission and the "balmy" Florida evening this past August when the Parker Solar Probe finally launched toward the sun. This video clip shows actual data from NASA's Solar and Terrestrial Relations Observatory Ahead (STEREO-A) spacecraft. The bright point marks the location of NASA's Parker Solar Probe as it flew through the sun's outer atmosphere during its first flyby in November 2018. While one might think the sun is cooler as you move away from its center, that's not the case: The corona is significantly warmer than the solar surface underneath it — about 300 times hotter. Fox said an important mission objective is to sample the plasma of the corona to see what physical processes are going on to create this puzzling temperature inversion. Mission scientists plan to glean more information about how this plasma shapes the heliosphere, too, which is the sphere of influence the sun has over the solar system. As the sun's plasma cools, it becomes solar wind, or charged particles the sun releases into space. Fox said this mission will be monitoring the "supersonic speeds" at which the solar wind moves. The probe will at times be crashing against the flow of solar wind, and at times moving outward along with it. The researchers will have to take this into account when studying the probe's data, Fox added later in the presentation. "The solar wind never sleeps, it never stops; it is continuously expanding away from the sun," Fox said. And the solar system, in turn, regularly responds to the solar wind. By studying the corona and solar wind, the Parker Solar Probe can also boost an understanding of the sun's effects on the planets. This mission might "find the missing piece of the corona puzzle," said Nour Raouafi, Parker Solar Probe project scientist at the Johns Hopkins University Applied Physics Lab in Laurel, Maryland. He said the team expects to be surprised by all the data they receive from the probe. The solar wind is made up of charged material that originates from the sun. Solar wind, along with singular eruptions of solar material called coronal mass ejections, are illustrated here as they carry the sun's magnetic field out through the solar system. The mission scientists talked about the probe's first approach of the sun, which happened from Oct. 31 to Nov. 11. On that flyby, researchers noticed that as Parker Solar Probe passes the sun, it could sit within a pocket of ejected plasma for several days. This is important, because the sun rotates, and so the star's structures move along with it. That makes Earth-based observations tricky, according to the researchers. Scientists "can't always tell if the variability they see is driven by actual changes to the region produced by the activity … or is caused by simply receiving solar material from a new source region," NASA officials said in a Dec. 12 statement that accompanied the Washington, D.C. presentation. The probe's thermal protection system is an essential component to this sun-kissing probe, but, as explained by Pete Riley, a research scientist at Predictive Science Inc. in San Diego, this system is also makes an earthly data-download tricky. At some points in orbit, the thermal protection system interferes with signals coming back to Earth, so this first orbit around the sun was a bit "geometrically constrained," Riley said during the event Q&A. Raouafi and Fox added that the next two orbits around the sun will be better for retrieving data. One audience member asked whether they planned to send the probe closer to the sun, with the idea being that the solar surface should be possible to reach if it's cooler than the corona. Fox answered that the temperature of the solar surface wasn't the issue, but rather, it's the increased levels of photons that make it impossible with this probe's technology. Photons are basic units of light that behave both like particles and waves. 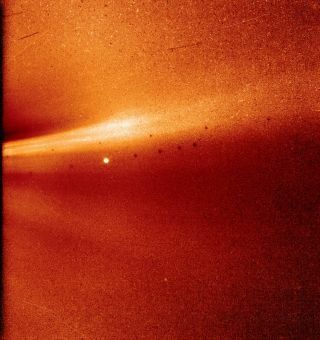 The Parker Solar Probe is the first spacecraft to get this close to the sun. The mission includes 24 orbits around the star, with its closest and final approach bringing it to within 3.7 million miles (6 million kilometers) from the sun's surface. This is shorter than one-eighth the distance between the star and Mercury.